With bilked investors hopping mad at Bernie Madoff--due in court to plead guilty tomorrow--here I want to suggest an explanation (but let's be clear, not an excuse) for how Madoff ended up ripping off not only individual investors but charities. It's one thing, we might think, to operate a ponzi scheme that robs the rich of their riches. But surely it is beyond the pale to do what Madoff did--namely, to take money from charitable organizations and purport to invest it, only to have it disappear down the big ponzi hole. Perhaps Madoff was thrilled and thought to himself "Oh goody, finally a chance to rip off not just some rich indivduals but the Elie Wiesel Foundation for Humanity and the Gift of Life Bone Marrow Foundation. I hate those do-gooders." 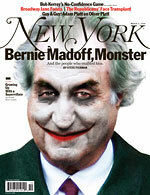 Perhaps Madoff is and was just that kind of monster. But it's also possible that initially Madoff took the charities' money reluctantly. At least we could see how he might have felt compelled to do so. Suppose that Madoff had turned down the charities. What would he have told them? Sorry, I can't help you because my investment firm is a giant ponzi scheme and I don't want to destroy your endowment? Investing with me is too risky because of market volatility? Any explanation Madoff might have given to the charities for turning down their business would have quickly become known to his other investors, which could have led to the unraveling of his whole scheme. I offer this hypothesis with three important caveats: 1) There may well be evidence that Madoff was NEVER even remotely reluctant to take the charities' money (although the explanation itself would predict why he would not have been outwardly reluctant even if he was inwardly reluctant); 2) Even if Madoff started out reluctant, it is in the nature of a pyramid scheme to need an ever-larger pool of investors, and so he would have been eager for funds from any source, including charities, nearer to the end; and 3) The logic I have identified in no way exonerates Madoff. Perhaps the best comparison for a blue-collar crime might be something like this: Snake puts on a ski mask and holds up a liquor store. During the course of the robbery, after he has deactivated the surveillance camera, Snake is overcome by an itch. He holds his gun to the clerk and tells the clerk to look away while he briefly takes off his mask to scratch his nose. In those few seconds, a customer enters the store and gets a clear look at Snake's face. To avoid detection, Snake shoots and kills the customer. Snake didn't go to the store with an intent to commit murder but he clearly ended up doing so. Likewise, even if Madoff did not originally intend to rip off the charities, he ended up doing so for the same sort of reason that Snake killed the customer--to avoid detection for his already-committed offenses.